The three-day Aintree Grand National Meeting continues each year on the Friday with Ladies Day. This day, in modern times, has been earmarked by many as the ‘fun day’ of the Grand National festival. Dubbed #FabulousFriday, you can expect a sea of fashion, bubbles and famous faces. With a bigger 45,000 crowd expected at the Grand National Ladies Day 2019, attendance ramps-up from the opening day. While there are high calibre races to bet on, it’s generally party-time for much of the afternoon. Of course, there is top-class racing to enjoy too with seven decent contests that start at 1.40pm. But for many of the 45,000 crowd, the attention is primarily on the other side of the track, with events like the ‘Style Award’. Style Ambassadors mingle with the crowds in the Red Rum Garden to find the winner of this coveted award. With big prizes like cars, holidays and cash up for grabs, Grand National Ladies Day is a hugely popular day in the UK Jump racing calendar. In 2019 the day falls on Friday 5th. In recent years, the day has also become famous for celebrities, mainly in the Liverpool and Manchester areas, making an appearance at the track – with Coleen Rooney being a current example. With many tabloid newspapers covering the day, this day has a certain hype for the who’s who of the glossy magazines. What Is The Grand National Ladies Day Dress Code? Believe it, or not and unlike Royal Ascot Ladies Day, there is no official dress code for Ladies Day. However, if you did turn up on Ladies day in tracksuit bottoms and a t-shirt, not only would you feel extremely out of place there is a chance you’d not be let in anyway. Ladies Day is called that for a reason. If you are attending then you have to get into to spirit of the day and dress up. For the ladies, this means colourful dress and hats, while for the men you’ll look out of place if you are wearing anything but smart trousers a shirt and a jacket! 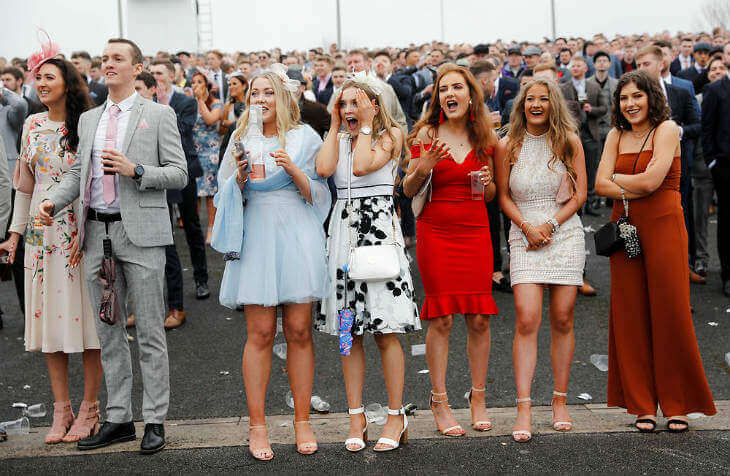 How Much Do Grand National Ladies Day Tickets Cost? With demand up, prices are also on the increase on Ladies Day. The cheapest ticket £43 for entry into the Tattersalls Stand. This goes up to £115 for an upper seat in the Lord Sefton Stand, or if you prefer something a bit more in the middle of the Tattersalls and the Lord Sefton Stand then the Lord Daresbury or Princess Royal Roof options at £88 might appeal.